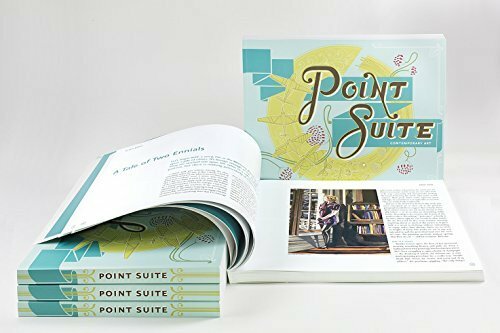 The Point Suite Contemporary Art Book is a unique endeavor created and produced by artists Annika Connor and Nicholas Papadakis to document and share the artworks of their extended community. Featuring a wide array of local and international painters, sculptors, print makers, and photographers The Point Suite Contemporary Art Book presents the art of the next generation of up and coming artists. Capturing an idea, a conversation, a moment in time, is something all artists seek to do. Toni Morrison says, "If there's a book that you want to read, but it hasn't been written yet, then you must write it." The Point Suite Fine Art Book is Active Ideas Productions answer to that challenge. AIP hopes that the artists in this collection will inspire, that the images will entice, and that this book will highlight for you some of the fresh new art that is currently being created. Artists: Marta Abbott, Gabriela Alva Cal Y Mayor, Claire Brassil, Megan Burns, Annika Connor, Tom Costa, Jason Cuvelier, Steve Day, Teodor Dumitrescu, Mark Dye, Jared Fisher, Micah Ganske, Kate Glasheen, Chad Griffin, Palden Hamilton, huber.huber, Ariane Irlé, Hidenori Ishii, Chris Jahncke, Jill Jeannides, Melanie Jelacic, Shay Kun, Jeff Musser, John Otter, Nicholas Papadakis, Joseph Paxton, Jason Peters, Colette Robbins, Woody Shepherd, Omar Thompson, Jennifer Tull Westberg, James Wolanin, Koichi Yamamoto and Carolina Zorrilla de San Martin. Essays by David Gibson, David Pullins, Lisa Williams, Jeff Klingman, Christina Von Rotenhan, Alex Morris, Masha Rumer, Malina Saval and Melissa Giannini.